Knitwear accessories by Elyse Allen. Photo courtesy of ACC. When August arrives thoughts turn towards autumn. Not long off is back to school, back to work, and a new season of fashions. Oh, and did someone say Christmas in July? How about The Holidays in August? To get a head start on it all, my favorite outing is the American Craft Council Show at Fort Mason Center, July 31 – August 2, 2015. This is our chance to check out high-end handmade items such furniture, home décor, fashions, and jewelry. Think new for fall, think gifts, think one-of-a-kind. The American Craft Council Show is the largest juried show west of the Rockies and one of a handful of shows across the country that highlights the best of the best in handcrafted works of art. Over 220 American artists gather at Fort Mason to show and sell their unique wares. Also this year there’s something called Hip Pop, which is a section of the show that features new and rising artists. Let’s Make is all about inviting attendees to watch artists at their craft and maybe even give it a whirl themselves. It’s all fun and a wonderful opportunity. I say this season skip the big box stores and corporate brand names. Instead, get your unique on at the American Craft Council Show. Friday, July 31: 10 a.m. – 8 p.m.
Saturday, Aug. 1: 10 a.m. – 6 p.m.
$29 Become a member of the American Craft Council and receive entry to ALL THREE days of the American Craft Council Show in San Francisco & a one-year subscription to American Craft magazine. As a journalist in Cambodia, I have been interviewing garment workers about their lives for more than three years, but I never thought to interview them about what they wear, although I have often been struck by their de facto uniform: blue jeans, trucker hats, and screamingly bright T-shirts and hoodies in vivid shades of magenta or neon yellow, often accented with leopard print and rhinestones. It’s a far cry from the drab attire conjured by the phrase “garment worker.” I had always, perhaps naively, taken these colors as a way of asserting individuality in the face of the numbing repetitiveness of factory labor. But this turned out to be only a minor concern in the complicated calculus of dressing oneself on a salary of around $80 a month. – Julia Wallace, Journalist and contributor to the book Women in Clothes (Blue Rider Press, 2014). 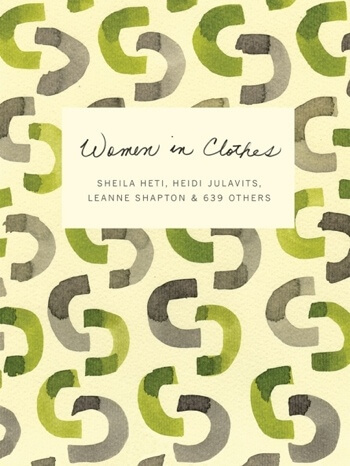 Women in Clothes is a collection of essays and conversations by women from around the world about clothing – what we wear, how we wear it, why we wear it and what it all means. 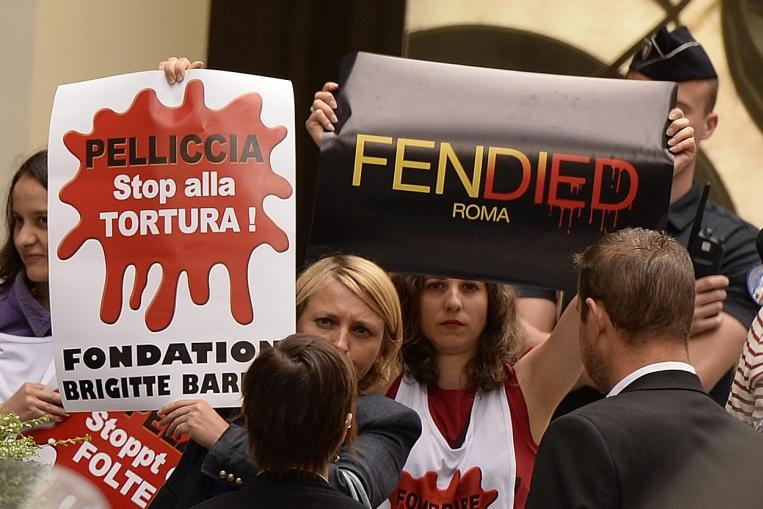 Animal rights activists from the Brigitte Bardot Foundation protest Lagerfeld’s use of fur. It was my way of highlighting Karl Lagerfeld’s incoherence – he bends over backwards for his cat but doesn’t care an ounce for all the animals sacrificed for his collections, for this most futile and vulgar of fashions. Fur is not luxury: it is an industry of death and suffering. We must boycott fur coats, as well as all the accessories. It is unbelievable that in 2015 this is something we have to fight for, when it really should be obvious to all. – Brigitte Bardot, French actress and animal rights activist. Ms. Bardot is speaking about the open letter she sent to Karl Lagerfeld’s cat after the designer’s all fur collection for Fendi at the recent Paris couture fashion shows. Thank you, Ms. Bardot for shaming Lagerfeld and for bringing this important issue to worldwide attention. I am of the opinion that styles are at no period really unbecoming. If a woman adheres to the proportions and the formula of a given epoch, she will acquire an allure, a feeling of rightness that makes her sense she is attuned to and in equilibrium with the times. By embracing a particular fashion and using it with an instinctive feeling for its organic relationship to the moment, she can make it her destiny. – Cecil Beaton (1904-1980), British fashion and war photographer, award-winning stage and screen costume designer. This quote was taken from Mr. Beaton’s 1954 book – The Glass of Fashion: A Personal History of Fifty Years of Changing Tastes and the People Who Inspired Them. Note Mr. Beaton’s writing style, which today might be considered “overdressed” but I find it refreshing for its flow and rhythm. 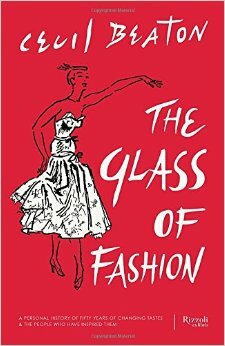 He also makes a good point – for people who want to be fashionable, follow the structure of current fashion and own it. That will lead to confidence and a certain connection to the times. Styling your own line before it goes to retail. “I have become very frustrated shopping for clients at local boutiques because of things like irregular sizing, quality and price discrepancies among many other things I know can be fixed,” says Ms. Cooper who is also attending designs classes at the Academy of Art. Don’t miss this unique opportunity to get some straight talk from people who know. JEAJA Design Studio, 319 14th St. Oakland. Free for OFN members. Discounted $10 advance tickets via Eventbrite, $15 tickets at the door. 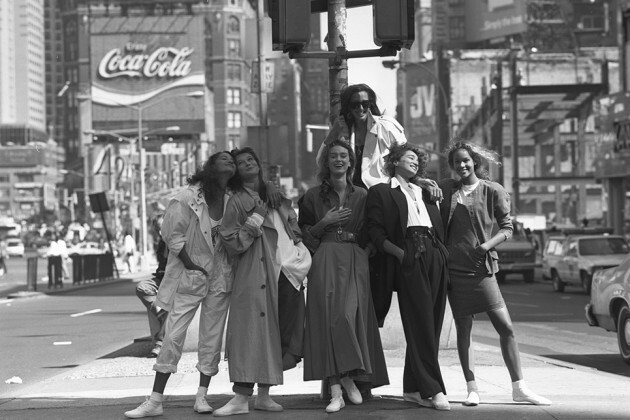 Donna Karan top right in the 1980s with models sporting her line. Donna Karan is a part of me — past, present and future. It has been an honor to speak woman to woman about ‘Seven Easy Pieces’ that forever changed the way women dress. – Fashion designer Donna Karan. Ms. Karan announced last week that she is stepping down as chief designer from her namesake brand, which she founded with her husband in 1984. Later in 1996 the company went public and then in 2001 LVMH Moët Hennessey Louis Vuitton bought all outstanding shares. The Donna Karan brand was a favorite of women in the 1980s when she designed the basic jersey bodysuit and other pieces to coordinate – called Seven Easy Pieces. 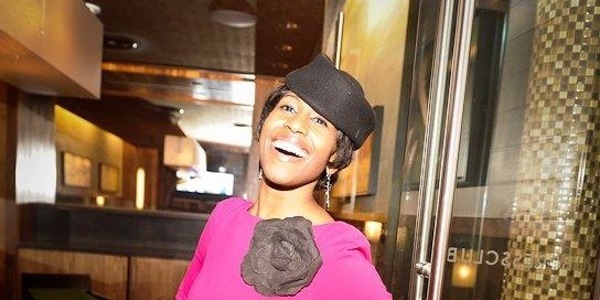 She was thought of at the time as a lifestyle designer, not just a designer of clothes. Frankly, I don’t see how the brand can continue without her. Ms. Karan says she now wants to devote more time to her other line, Urban Zen. It’s the end of a fashionable era. Laurel May Bond looking good revisiting the 80s in vintage mesh Jean Paul Gaultier. Laurel May Bond and I met in 2008 when she was Laurel May (sans Bond) and I was covering the launch party of a new magazine, 944 San Francisco. As the editor of the celebrated publication, Laurel was in demand at the event and I was having a heck of a time getting to her through the crowds of people in a very noisy Bently Reserve. I happened to meet a couple of women who said – Hey, Laurel is our pal … we’ll introduce you. They did and what a humorous delight was Laurel, making my job of getting good quotes a breeze. After that she hired me to write a couple of articles, one of which was my all time favorite journalism adventure – an interview with a high-end closet. Those were the days! Currently Laurel is a freelance writer, recently married and living in Paradise Valley, Arizona. She agreed to chat with OverDressed for Life about her fashionable teenage years. What was the fashion style like in your hometown? 1980’s Scottsdale, Arizona had a very prescribed dress code. It was, and still is, a very uniform/better to fit in than stand out kind of place. Today you’ll see carbon copies of the Real Housewives look, but when I was growing up and defining my style it was Preppy Handbook meets wannabe Malibu casual. Bass penny loafers (with dimes, not pennies), or blue Sperry topsiders, madras Ralph Lauren walking shorts, spiral perms, twin sets, pearls and the like. Lots of Lily Pulitzer. ugh. How did your style differ? Somehow I ended up with a subscription to Interview Magazine which completely took over my life. I imagined myself some sort of dark beatnik trapped in a suburban hell. I was always attempting to recreate the fashions I saw in the New York party pics. I wore 5 crinolines at a time and stacked Bakelite jewelry, vintage furs, rhinestones, asymmetrical everything. I stole my dad’s Izod golf sweaters and wore them backwards with no bra and I took all my mom’s old crocodile pumps and glued brooches to them. Who and what influenced you? Early So-Cal punk rock, Vivienne Westwood, Malcom McClaren, Debbie Harry, anyone who could get into Limelight. How did you go about creating your look? Downtown Phoenix thrift stores were untouched treasure troves. Nobody shopped at second-hand stores except people who actually needed to, so they were buying up chinos and work dresses and very normal stuff. Vintage as a style hadn’t really “hit” yet (I think Pretty in Pink sort of set it off) so there were just oodles of funky weird old stuff hanging from the rafters for pennies on the dollar. I used to buy these great teeny tiny Edie Sedgewick-worthy psychedelic day dresses by the arm load. There was also a glut of frothy vintage prom dresses from the 1960’s that were great for modifying by shredding or ripping out under layers to make them more provocative. There was also quite a bit of super prime dead stock that would come floating around every once in a while. I scored the most amazing vinyl white lace up go-go boots, early model Ray Bans – stuff like that, all brand new out of the box. To supplement, once a quarter or so, I’d steal my mom’s credit card and go buy a feather boa or a hat or something crazy from a high-end department store – for juxtaposition. How did your parents react to your style? My parents were über conservative. They were mostly just mortified when I started wearing vintage clothes. They couldn’t fathom why I would want to wear “used” clothes. I used to swing by my dad’s office (he was in the semiconductor business) to have lunch or say hi every week or two, and one day he asked me not to come over anymore if I was going to be dressed like a clown. It made me really sad! Kids are so lucky today to have the freedom to express themselves in so many ways. Did you find other girls/guys who followed your lead? The Phoenix punk scene was tiny, but all the various broken toys found their way there. It was a mish-mash of scooter culture mods, some freaky early goth types and just your run of the mill non-conformists. As far as fashion went, though it was pretty interesting. People were definitely testing some “looks.” There was also an amazing gay bar (Hotbods) which was just about the closest thing to fashion heaven you could get in Phoenix at that time, although there was a lot of Generra pants happening in there – the hairstyles were on point though. How did you feel standing out? Today it’s like the weirder you are, the more you’re saluted. People are like, “YAY look how weird I am! I’m so quirky! Go me!” but when I was a teenager it was the opposite. People would throw trash out their car windows at me as I walked down the street, I was bullied a bit at school by the mean girl clique, pointed and laughed at. I just remember thinking, “Ya’ll are so stupid, you don’t know anything about fashion. You’d never get into a New York club.” I was 15. Hah. What was the takeaway for you having experienced being different? A certain self-confidence. I look at photos from the 1980’s and my cool “popular” friends all look like idiots with puffy sleeves and sweaters tied around their necks like young republicans. I had blue hair and I was wearing ripped stockings and pointy witch boots imported from London. I would totally wear any of my outfits from back then today and go for a stroll down Mission and blend in. One thing I’m able to do now thanks to the internet is to go online and actually purchase some of the looks I coveted but couldn’t afford or even find when I was in high school. I have some treasured vintage Kamali, Betsey Johnson, and Vivienne Westwood pieces. I have a totally ridiculous 80’s-era mesh paisley Jean Paul Gaultier pantsuit, which I wore to the opening of the Alexander McQueen Store in Vegas and got loads of compliments on. What advice would you give your daughter or anyone who chooses to lead their own style parade? Wear what you feel. Be as “you” as you can possibly be. Clothing is just another language of the soul. It feels so good to express it. Everyone wants to . . . some folks are just chicken. Plus, no one’s paying as much attention to you as you might think. I couldn’t agree with you more, Laurel. Thanks for being your own stylin’ self.